Hanergy Solar Giant wants to dam the largest free flowing river of Asia? Great Amur River saved by rivalry and mistrust may be degraded in the name of friendship. The new vision of "Ecological Civilization" put forward by China’s Communist Party is coming to a decisive test as leading "new clean energy" company Hanergy, which suffered a severe failure at HK Stock Exchange, proposes to Russian Ministry for Development of the Far East to revive an old plan for a giant dam to harness flow of the greatest untamed river of Asia. The Amur River (Heilongjiang in Chinese) is formed by the confluence of Shilka and Argun rivers; it flows into the Sakhalin Bay of the Sea of Okhotsk. The length of the river from the confluence is 2800 km, the catchment area is 2.1 million km2 . The Amur basin is shared by four countries: Russia, China , Mongolia and North Korea. The Amur is a highly transboundary river network: the Russian-Chinese border goes along the rivers Argun, Amur, Ussuri, Tur, Turga, and Sungacha for more than 3,500 km. This is by a the largest transboundary river both in China and Russia. For an area lying far in the north between boreal and temperate realms, the Amur Basin has surprisingly rich diversity of species. Since its large area is split between three countries and 15 terrestrial ecoregions no one has calculated so far overall basin-wide taxonomic diversity. There are at least 6000 species of vascular plants, 130 fish species, at least 600 bird species, about 200 mammal species. Among fish there are at least 10 salmonids, including the rare Siberian Taimen, as well as three kinds of sturgeon. Endangered Kaluga and Amur sturgeon are the most famous endemics of this river basin. The Basin’s global significance is also due to its large areas of wetlands, which serve as habitat for the diverse bird species, including several critically endangered cranes. Major bird migration flyways cross the region with stopover sites in wetlands. The Amur River Basin ecosystem generates and brings nutrients to the Sea of Okhotsk, which play a significant role in the sea’s biological productivity and that of the neighboring regions of the Pacific Ocean. Therefore it also effectively supports major fisheries industry of Japan. This river is one of Nature’s wonders and is recognized as one of 200 most important ecoregions of the world. However not everyone appreciates its free-flowing qualities. In 1956 China and USSR signed an Agreement for cooperative research on development of Amur River Basin, which suggested development of a cascade of 4 to 9 reservoirs in the Upper and Middle Amur River with total storage volume of more than 250 cubic km and surface area of 6,000 km2. In the 1960s relationships between the two countries deteriorated to the brink of war and this plan was never implemented. Meanwhile Russia created giant Zeya Reservoir and started construction of Bureya River Hydro, while China added several new hydropower plants (HPP) to already existing Xiao Fengman HPP built in the late 1930s on the Second Songhua River. Bilateral relationships improved by 1986 and a new agreement was signed to develop “USSR-China Joint Comprehensive Scheme for Water Resource Management in Transboundary Stretches of the Argun and Amur Rivers”. The initial intent was to review development opportunities in hydropower, flood prevention, fisheries, and clean water supply. However, while China clearly prioritized hydropower and dismissed any modifications that threatened electricity outputs, Russia was eager to explore trade-offs between all sectors of the economy and sought compromise. The latest version of the Joint Scheme proposed up to 6 dams on the Amur-Heilong River main channel, while the Argun River also was to be developed in a 3-dam cascade. Three dam locations on the Amur River: Khingansky (Taipinggou), Dzhalindinsky (Lianyin) and Amazarsky(Mohe) were called "first-stage dams". However, by 1999 the sides failed to agree on many specific issues including dam height, exact location, reservoir volume and regime, mitigation of impact on fish stocks, and many other environmental issues. Finally in 2000 country delegations declined to approve the full voluminous Joint Scheme document, agreeing only on its 100-page synopsis with many points of disagreement listed in the text and all resulting materials were shelved. The Joint Scheme evoked considerable public debate in Russia because it did not carefully review alternatives for river basin management and socio-economic development. According to Russian data, implementation of the Joint Scheme would result in radical alteration of hydrological and ecosystem processes throughout the basin. Beyond obvious generic impacts from inundation by reservoirs, most notable effects include radical changes in sedimentation patterns in the Lower Amur, creation of an impenetrable barrier for migrating fish, and significant alteration of the wetland hydrological regime of the Amur-Heilong valley downstream. 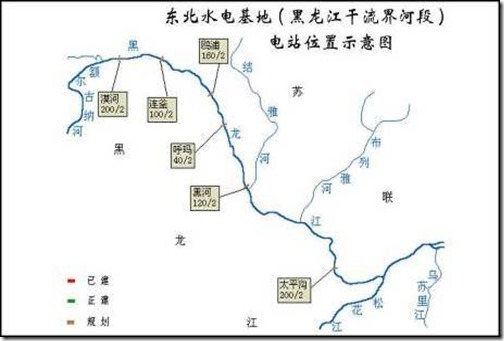 : Khingansky (Taipinggou) Dam was considered the most potentially harmful due to it downstream location and unique natural value of surrounding landscapes. In Russian agencies focus of hydropower development in Amur River basin gradually shifted from damming main stem to cascade development on tributaries. « Strategic Development Program for Russian Far East and Transbaikalia till 2025” does not envision damming the main stem of Amur. RusHydro State Company that holds all hydropower assets in the basin does not mention damming Amur main stem sites in any of publicly available plans. RusHydro has completed in 2014 construction of 2000 MW Bureya HPP and is presently building a 420MW counter-regulator dam downstream. Russian Far East already has significant surplus of electricity, which makes construction of new HPPs problematic. In 2005 a plan emerged and was discussed with Chinese counterparts to build new power plants to deliver 60 billion KWh annually to China by 2015. By 2013 exports barely reached 3 billion KWh and were decreasing ever since due to weaker demand in China. The Amur Basin Water Management Authority (branch of Water Resources Agency) insisted that not hydropower, but preventing river bank erosion and flood mitigation measures on transboundary watercourses should be the focus areas for new Water Management Scheme, as well as the highest concerns related to transboundary water pollution that threatens water supply, fisheries and river ecosystem integrity. 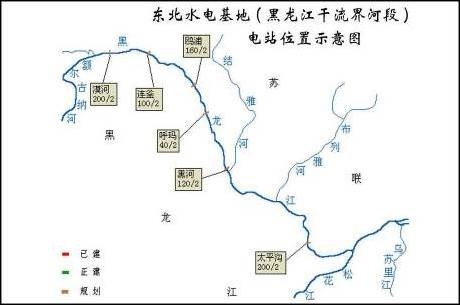 Nevertheless, China’s Hydropower Sector still consistently supported damming Amur-Heilong main channel and all dams proposed by Joint Scheme on the Amur-Heilong mainstream are still found on maps of future hydropower construction sites. Another strong dam proponent is Hegang City of Heilongjiang Province which presses adjacent Jewish Autonomous Province in Russia to promote jointly construction of Khingansky-Taipinggou Dam. In 2007 Chinese side proposed to cover full costs of construction of transboundary structure and use all generated energy, since there is no apparent need for surplus energy on Russia side. Environmental issues and damage to anadromous fish stock was presented in Chinese press as main impediment to agreement with Russia. Since 2007 Russian officials did not support this proposal either at provincial or national level. Finally during recent years b damming the Amur river also did not look as priority either in energy sector or in overall water resources management agenda of China. The 13th 5 year plan never mentions hydropower construction as priority for China’s Northeast. The most prominent water-related objective is that the Amur-Heilong area “should become the biggest grain producing base in the country, with the proportion of irrigated land increasing where conditions allow”. Water shortage is seen as growing problem, therefore water saving, wetland conservation and selected water transfer projects are seen as priorities. After famous toxic spill into Songhuajiang in 2005 the main focus shifted to preserving water quality and aquatic environment:. However, responsibility for project development rests with the Russian Ministry for Development of the Far East which is infamous for lack of public oversight and number of failures. In late July 2016 the State Programme "Socio-economic Development of Russian Far East and Transbaikalia" carried out by this Ministry was recognized as the least efficient and non-transparent from among all national economic programs implemented in Russia. But since it has influential lobbyists it was not cancelled as requested by Russian Ministry of Economic Development, but revamped and refueled to run till 2025. 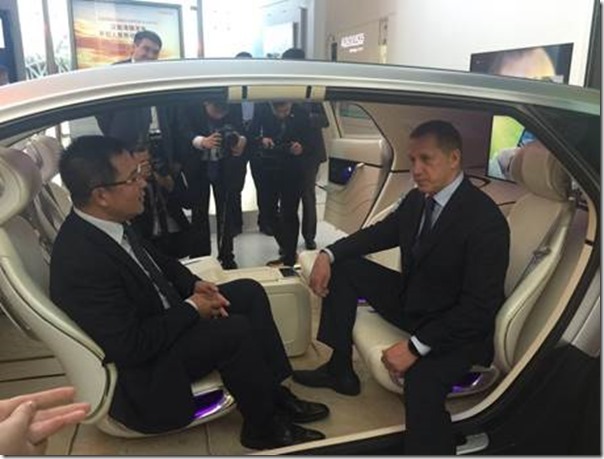 The Ministry for Development of the Far East is patronized by influential Russian vice-premier Yury Trutnev, the Plenipotentiary Representative of the President Putin in the Far East, who was also recently appointed as the Chairman of the Board for the .RusHydro State Company . On June 24 2016 this statesman visited the headquarters of Hanergy Holding Co., where after inescapable ceremonial ride in the solar automobile and a tour of other solar wonders he proceeeded to talk business with the hosts. According to Hanergy’s web-site Mr.Trutnev thanked Hanergy for their efforts in nature conservation and then promised to support further advance of their proposal to dam the Amur River. Hydropower development is one of the most controversial topics in Russia, it is unclear how Trutnev and Hanergy are hoping to avoid massive protests. Just recently in 2012 a wave of protests in 5 provinces led to cacellation of a comparatively less damaging proposal by CTGC and En+ to build a dam across the Amur’s main source -Shilka River. Russian energy companyEn+ even teamed up with WWF to undertake basin-wide assessment of hydropower risks. This assessment has shown that Khingansky-Taipinggou Hydro is the champion in terms of negative impacts among 50 potential sites considered in that assessment. If Hanergy goes for it there likely will be overwhelming protest both from Russia and international environmental community, which is well aware of Amur river unique values. Meanwhile reputation of being "green" is the major asset Hanergy holdings Co has not lost yet. It is being presently investigated by HK Exchange for alleged building of financial pyramid, it is being sought by many creditors for not being able to pay its debts in time due to recent financial fiasco, it loses markets and partners because its solar thin film is less competitive than originally expected… But so far it is still widely known to public as the Pioneer of Green Solar Energy, despite the fact that it gets resources for solar experiments from exploitation of a Jin’anqiao mega-dam on Jinsha River. 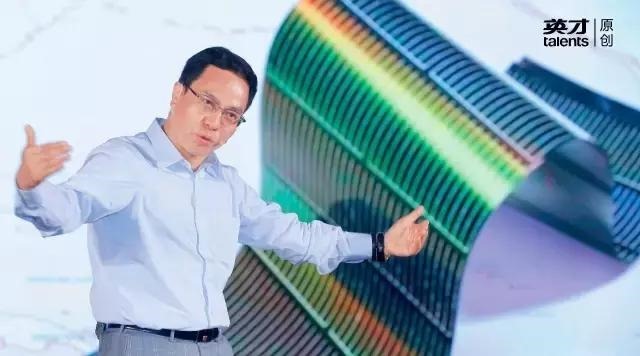 So the greatest credibility of the company and its founder and owner Li Hejun is due to their pure green intentions and genuine devotion to "make the world better" by paving it with fotovoltaic film. However as soon as it makes public a crazy plan to finish off the largest free-flowing river ecosystem of North Asia, its green image may evaporate overnight. The biological riches of Amur river are so well known, globally significant and irreplaceable, that any new (actually the 6th) attempt to dam it will bring to those who initiate it a fame of "anti-environment company" and may ruin their reputation forever. There is irony in the fact that Hanergy Holdings propagating solar energy use in UK, EU and USA became the major driving force behind one of the most environmentally destructive projects one can imagine. The Rivers without Boundaries International Coalition will address the Hanergy’s owner Li Hejun with an open letter warning him against any attempts to dam the Amur River.